Tis the season for hacking, and [Nick McClanahan] at the GadgetGangster is certainly showing off his Christmas spirit with his most recent creation. He had an animatronic Rudolph the Red Nosed Reindeer toy sitting around and thought it would be fun to convert him into an email reading machine. He tore open the toy, removing its innards, disconnecting the built-in speaker and servos from the original PCB. He then extended wires from those components outside of the body before reassembling the toy. The reindeer is controlled primarily using a Propeller Platform, with an E-Net module and a small audio amp taking care of network communications and audio output, respectively. Most of the work is done by the software [Nick] is using, which allows Rudolph to periodically check his Gmail inbox for new messages. When the message count increases, the reindeer springs into action, moving and lighting up his nose before announcing the sender’s name. He’s using a phonemic voice synthesizer for the output, which does the job, though we would go mad if we had to listen to it all day. 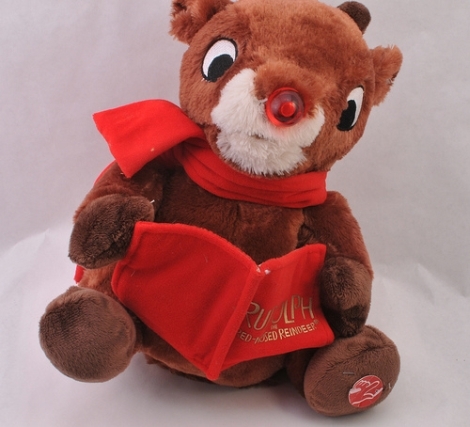 Since the reindeer is connected to his LAN, it might be feasible to run the data through a more robust voice synth on a PC, returning a better-sounding audio clip for playback. Check out the video below to see a short clip of Rudolph in action. With that voice, ol’ Rudy would be roasting on an open fire before the Holidays were through! Personally, I like the Umbrella project “hidden” in the instructions.. There’s some meat there to play with..
Looks like Rudolph, sounds like Hawking. You know those echoing microphone kids toys with the springs in them? If you could fit those springs near the speaker, you could make it sound kind of Borg-like. Then it’s a few other cybernetic enhancements away from being fully assimilated. Why would you need to know when you have received a new email. you will have some more spam email. At least Rudy would give me a different type of headache. I wish someone would throw a loath of bread at me, then I could have a spam sandwich or 1,000.